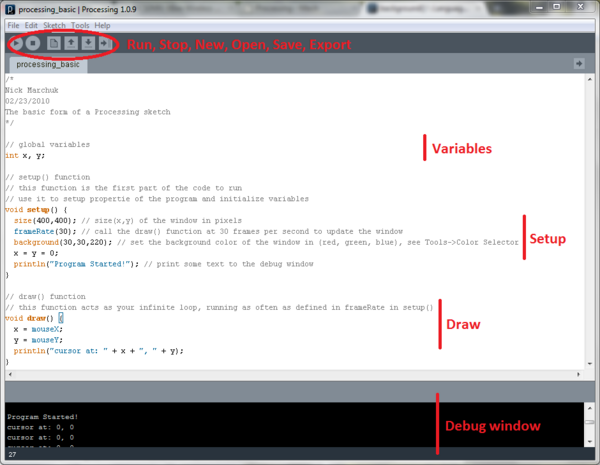 Processing is an open source programming language and IDE based on Java. It is free, works on PC/Mac/Linux, and is easy to learn. 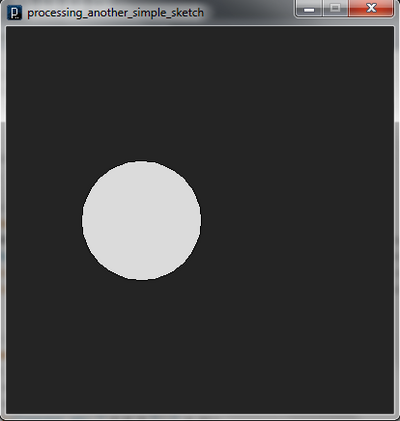 Processing lets the programmer quickly make visual objects and interactive programs. It is also easy to use Processing to communicate with a serial port, so programs can interact with microcontrollers. This wiki page will describe how to get Processing, create a simple program, open a serial port, and use an external library to create a GUI (graphical user interface). At the end you will find a template for a Processing program that is ready to communicate over serial and interface with GUI objects. Processing can be found here. Download, unzip and install Processing. This will create two important folders. The first is the folder you have unzipped. It contains the actual Processing program. The second folder is something like Documents/Processing, depending on your platform. This folder is where you store your projects and add libraries. Processing comes with a large number of great example projects. Go to File->Examples to see example code specific to making 3D objects, Basics, Libraries and Topics. The Processing website also contains example code and links to other projects that may contain examples. Processing is designed to allow people who are unfamiliar with programming to quickly get up and running making visually compelling programs. A Processing file is called a sketch. The IDE is shown at the right. A sketch is saved as a .pde in its own folder with the same name and opens in a tabbed format. A simple Processing sketch is shown at the right. The IDE has several icons at the top which allow you to run your code, stop running code, save and open code, and export your project. At the bottom of the IDE is a debugging window that you can write to with the print() and println() functions. Processing is object oriented, which basically means that all functions are data structures, and all of your code will run in functions. All Processing code has at least two major functions, setup() and draw(). setup() is the first function to run. In it you define the size of the window that Processing opens, how fast it updates, and initialize any variables or other functions. 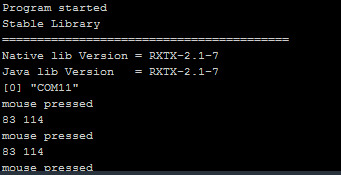 setup() runs only once. draw() runs after setup(). draw() will be called a certain number of times a second, as defined in frameRate() in setup(). This means that draw() functions as an infinite loop. Typically you use draw() to update your graphics. You can also use draw() to check the status of variables, the mouse position, and other objects. Global variables. Remember that variables declared in a function, like in setup() or draw(), are local and their values will not be remembered between multiple calls of the function, so global variables will be needed, but try not to use too many, their use is not good programming style. They will eat up your memory and can get confusing. It is much better to pass variables between functions instead of using globals if at all possible. void draw(). In this case when draw() is called we put the value of the mouse position into the variables x and y and print them to the debug window. 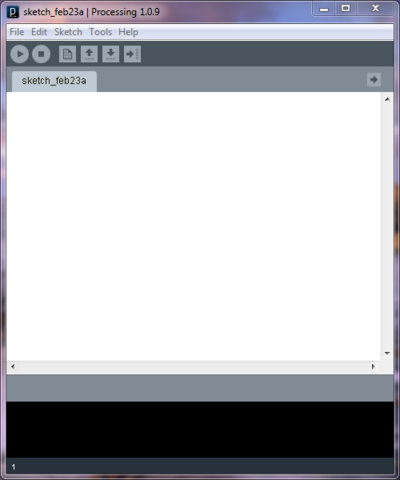 Running this sketch will produce a blue window and a stream of text in the debug window. Hit the escape key or the stop button to end the program. Lets edit the simple program and add some objects. Lets declare a function that will take the position of the mouse and change the color and radius of a circle and inversely change the background color of the window. Lets also move the circle back and forth across the screen. To get Processing to interact with a microcontroller, we will open a serial port and read and write to it. What you read and write will depend on what you plan to do. 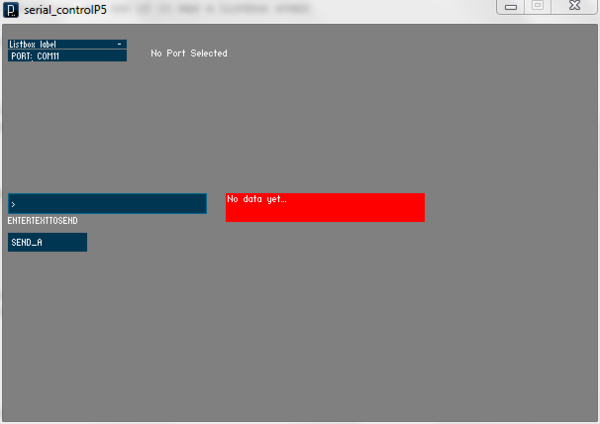 This section will describe how to see the available comm ports, initialize one, write to it and read what comes in. to the top of your code. You could manually type this in as well. The serial library contains the data type Serial, which allows you to set the baud, flow control, and writing. A serial Event is created when Processing receives data, allowing you to read. The following code will initialize a serial comm port, write and read. // expects a stream of input strings, in the form of "# #\n"
A GUI contains elements like check boxes, radio buttons, regular buttons, labels and text entry. 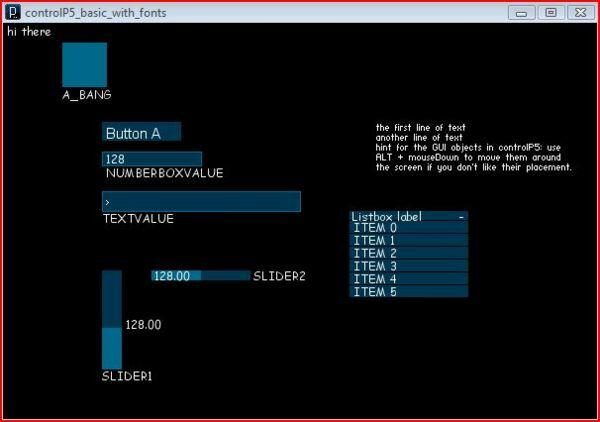 While it is possible to write your own custom objects to perform the function objects found in a GUI (see the Examples->Topics->GUI->Button example), it would be even better to use a library that contains all of these elements. Processing does not come with a library of GUI objects, but there are several external libraries created by labs and individuals around the world with GUI objects. Check the external libraries available here (scroll down to see them). at the top of your sketch. This library comes with some great example sketches that show off the different objects it provides. Look under my docs/Processing/libraries/controlP5/examples for 40 different example sketches demonstrating the use of individual GUI objects. You can declare your object at the top of your code like "Textarea myTextarea;" and use "myTextarea = controlP5.addTextarea(..." in setup() or directly use "controlP5.addButton("buttonA",0,100,100,80,19);" in setup() to add the object. The former method is better for objects that you want to change dynamically, like the text in a textArea. The later method is good for objects that you will not need to change after they are initialized, like buttons. This section will describe a template for Processing projects that use a GUI interface and serial communication. It is often a challenge to share code between PCs when the serial port is hard coded for one PC because the name and number of comm ports differs on every PC, particularly when the computer has bluetooth. This template attempts to solve this problem by listing all of the available comm ports and allowing the user to select the port they wish to use when the sketch loads. It contains all of the framework necessary to setup the serial communication and use common GUI objects. The Processing serial library does not have an argument to enable Hardware Flow Control, although standard Java does. If you replace the default serial library with a slightly edited one, you can use Hardware Flow Control, and only one line of code changes! You must specify all of the arguments to enable Hardware Flow Control.